This is in response to a post entitled RootsTech 2013 – The Nitpicker’s Critique, Part 2, written by Banai Feldstein early last week. While I agree with some of Banai’s points, I was a little hurt by the comments made about me specifically. I’d like to take this opportunity to defend myself, defend the other bloggers and give everyone a glimpse of the Official Blogger’s responsibilities as I understand them and where some improvements could be made; and share some other thoughts on such a program. Over the last few months, I have had to learn to adjust to a new way of life because of some serious health issues. One of those adjustments has been “letting go” of the things that stress me out since stress is not good for my health (nor anyone’s really!) and learn to not take things personally. And on top of the health issues, I am also dealing with other personal crises, so I REALLY should be letting go…but you know what? I am beyond stressed right now and am in a very fragile emotional state as it is, and I don’t like it when someone calls me out on something without having their facts straight. As a researcher, this really bothers me, since we’re not supposed to jump to conclusions without a thorough investigation. So I’d like to defend the statement made against me. Julie Cahill Tarr, GenBlog, uses a different search on her Blogger blog, but if it’s to be trusted, she hasn’t mentioned RootsTech since posting tips for attending before the conference and listings about the streaming sessions. First, yes, I do use a different search, but Banai had three other options if she didn’t “trust” the search. One, I use labels and those can be found by clicking the Topics tab in my main menu, or the “Posts by Topic” link under the heading “Table of Contents” RIGHT ABOVE the search box! Second, once she found a post, she could have easily clicked on the label link from the post. Third, if she prefers Google, she could have done an advanced Google search on my website specifically. Regardless, when I did a search on RootsTech for my blog, the first three were for 2013 and wouldn’t ya know, one of them was a recap…I certainly didn’t write a recap before the conference! Perhaps it’s because I’m a nobody compared the most of the other bloggers, who have been around the genealogy world much longer than I, so I didn’t warrant a thorough investigation. Heck, I didn’t even warrant a link to my blog like the others! Just a complaint that I didn’t do my job, which by the way, I did, and received no perks this year like the other bloggers. Yes, that’s right, I, like Lorine, did not attend the conference this year and instead participated remotely. I certainly didn’t receive a $99 check in lieu of the complimentary registration, nor did I receive a $25 gift card to Applebee’s for my own (and what would have been a very lonely) Official Bloggers Dinner, nor did I receive the goodie bag. Perks or not, I’d still do it out of the kindness of my heart, because blogging about genealogy is what I do. I promote all sorts of events, including those I am unable to attend, because it may be of interest to my readers. For the record, below are the posts I did for the 2013 conference across both of my blogs. Granted, it’s not as much as some of the “official” bloggers, or even “non-official” bloggers, but I do my part. And I usually try to add a little something to the “press release” type posts that adds some value to my readers, for example, the post about the keynote speakers. 09/24/12 How Can You Save $90 on RootsTech 2013 Conference Registrations? Read This Post!! 01/28/13 May I Have the Envelope, Please? 03/14/13 Can’t Attend RootsTech in Person? Attend From Home! My gripe is really about the fact that Banai’s complaints placed the focus on the individual bloggers, where it probably shouldn’t have. Additionally, I don’t appreciate the fact that I was mentioned in an unflattering way, when she didn’t thoroughly do her homework (admittedly, and I quote: “I tried not to spend too long analyzing all the official bloggers, so I did not verify that they all advertised leading up the conference….). Again, as a researcher, that bothers me. But enough about that, I rest my case. I would like to say something in defense of ALL Official Bloggers for RootsTech. Both years I’ve participated, we were told ahead of time that we would be helping to promote the conference. The caveat is that we were also told we would receive “regular story ideas and announcements” in the months leading up to the conference. This was not a reality in either year I participated. For the 2013 conference, I believe I received four announcements between the “official” notification in September and the conference in March (which is more than I received last year). Also note, this year, I did not receive ANYTHING after the conference as I had last year, such as notification of the Developer Challenge winner (heck, I didn’t even know who the contenders were, and the only reason I knew who won was because DearMYRTLE interviewed the winner). In my opinion, this is a big fumble on the conference organizers’ part., as some of us need a little reminder or inspiration to spread the word due to busy schedules or other obligations. And it’s hard to report on and/or promote something when you don’t know anything! I would have certainly blogged more if I knew what was going on, but I may as well have been a regular person on the outside looking in. That’s something the conference organizers need to improve if they intend to keep the Official Blogger program going (or change it up a bot, see Other Thoughts below). Additionally, as others have already stated, there has never been any sort of expectation set. Are we obligated to post every announcement we receive? In order to take advantage of the perks, must we post twice a month before the conference, blog each day of the conference, and post stuff after the conference? Beats me. If there are such expectations, they certainly weren’t shared with me, and from the sounds of it, not with the other bloggers either. While some of the bloggers welcomed spelled-out expectations, I actually think that’s a bit much…who has time to monitor all of that? Oops, I missed my two-post quota for the month, I just forfeited my complimentary registration…crap! Here’s the thing. Being a “good” official blogger takes some work. There are some who do a spectacular job and dedicate a lot of time. Most of us do what we can to help promote the conference beforehand, introduce people to the event during, and garner future interest with posts after the conference. It is what it is. Is there room for improvement? Of course, but I think it starts with the conference organizers providing the Official Bloggers with more information, consistently, from the time the bloggers are selected through the end of the conference. If I understand correctly, one of Banai’s frustrations was the shear number of Official Bloggers this year. In my opinion, it was ridiculous! And some of them weren’t even “official” for very long. I always linked to the Official Blogger page in my posts (on the Official Blogger image in the post) and it wasn’t until right before the conference that I noticed a huge addition to the original 15 or so bloggers. I’d never heard of any of these people, and I just assumed that they were somehow related to the Story@Home portion that was added to RootsTech, but I must admit, I never looked into it any further, so don’t take my word for it…I really have no idea where they came from or who they are. What a novel idea! When I was at RootsTech in 2012, I knew blogging was not going to happen…long hours at the conference, networking, and working at the FHL, left no time for blogging during the conference. But I did manage to tweet a little bit about the sessions I was attending. As I mentioned earlier, I did not attend this year, and was considered a “remote” Official Blogger. I attended most of the sessions that were streamed live, I tweeted during them (sharing thoughts, promoting the speakers, promoting the conference, informing people of the live streaming sessions, etc. ), and even wrote blog posts about some of them. I am a relative newbie to the national conference scene, so I want to take in as much as I can. 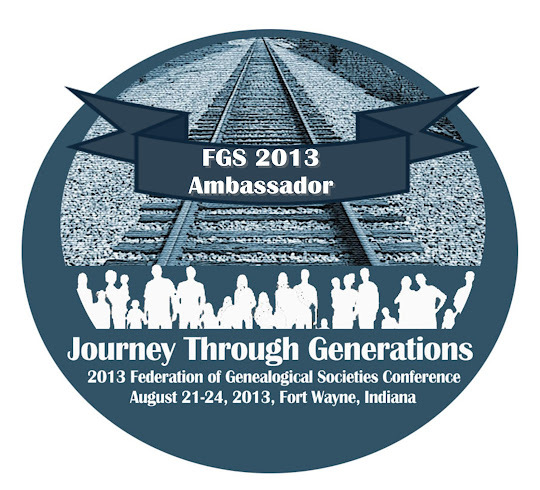 I want to think about what a speaker is saying and how it applies to my research, not “hmm, how should I report on this session in my blog.” In other words, I want to think as a genealogist, not as a reporter. For me, it takes away from the educational experience that I am shelling out money to attend. It’s not that I don’t want to share what I learn, but I do this through my blog in a more practical application (usually by a real research example or a how-to post) after I apply what I’ve learned to my own genealogy, which could be months after a conference. So I definitely lack in the “during” and “after” department of the Official Blogger “duties.” And if that makes me a bad Official Blogger, so be it. And if the RootsTech organizers don’t like how I approach my Official Blogger duties, or don’t like some of the suggestions I’ve offered in this post, then they have every right not to ask me to be an Official Blogger…and I’m okay with that. I hope that Banai doesn’t take my rebuttal as any sort of personal attack. I was a little hurt by her personal comment about me, but not angry. More disappointed than anything about the admitted lack of thoroughness on her part and then posting unflattering comments based on the incomplete research. I do understand her point, I think, which unfortunately was buried among the clutter of calling out the individual bloggers. If I understand the underlying message she’s trying to convey, it’s that other bloggers, even those with less “traffic” are just as capable of being an Official Blogger and the pool of the Official Bloggers could be be more diverse, which would help to reach even more people…totally agree! I also applaud her bravery for Part 1 of the post, which discussed several issues of RootsTech 2013 in general…even though I wasn’t there this year, I’m betting I would have echoed her complaints. My impression of the Nitpicker is that she(?) is one of those people who finds offense in everything. I didn't take any of those comments seriously, especially after the implication that bloggers were decided upon or excluded because of some ethnic or religious consideration, which I thought was just ridiculous. (Of course, I wasn't the one being nitpicked.) You have some great blogs, and you did a good job covering the conference. Particularly as a remote attendee! Keep your chin up, ol' pal. Great post, Julie! No one is required to respond publicly to criticism, but your response was an excellent one -- on target without being hurtful. Hope the health issues improve. As a health-challenged sort, I know all too well how priorities must be chosen and such matters do not wait until after a conference (in fact, often it's before a conference when stress level is the highest that health issues flare up). Best wishes! Excellent. I'm so glad you spoke up in your own defense, and I hope you can let Banai's words, whatever their origin, "roll off your back." Anybody can be a critic. But those who blog conferences, official, or not, are the ones who shoulder the deciding and creating. I admire this point you made. "In other words, I want to think as a genealogist, not as a reporter. For me, it takes away from the educational experience that I am shelling out money to attend. It’s not that I don’t want to share what I learn, but I do this through my blog in a more practical application (usually by a real research example or a how-to post) after I apply what I’ve learned to my own genealogy, which could be months after a conference." This is so true. I think that anyone who blogs a conference is doing so at some expense to their own educational experience. That is a generous and even heroic act. It deserves applause. Period. I'm sure your blog post has encouraged and heartened many people. Thank you for your kind words, Mariann. And I totally agree with your statement: "But those who blog conferences, official, or not, are the ones who shoulder the deciding and creating." So true! Julie - I don't think you needed to defend yourself but I understand how you felt you needed to. You did a good job! I wasn't aware you were, like me, a virtual blogger. Kudos to you for going above and beyond. Hey Lorine, I thought I was the only remote blogger until I read your post yesterday. It has certainly been a wild discussion...I hadn't seen the G+ comments until after I posted. I hope everyone can move on and that there are some changes in the future, especially moving away from a bloggers-only position. Julie, I had no idea that you did not attend. For that, you have my apology. Lorine's blog posts left me with that impression while yours did not. That recap post did not show up when I searched a couple weeks ago. If it had, then I would have known. I also did not realize your search results were not sorted by date. As soon as I saw 2012, I assumed everything after would be older. I did not see your categories, since most blogs have them all listed out in the sidebar. (Your way is kind of cool.) I have updated my blog post to reflect what I have learned here today. Thanks, Banai, for understanding. Not having the categories in the sidebar can be a hindrance, which is why I tried to put a link to the page in two different places, but it isn't always understood. I just have way too many categories and it takes up soooo much room in the sidebar. Hopefully one day, when I move over to WordPress, this won't be such an issue.